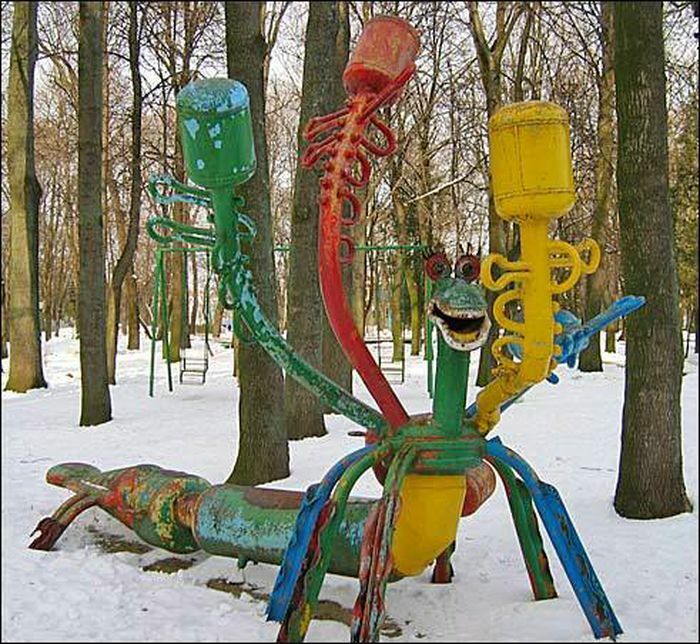 Here are some shots from kids playgrounds in Russia. This one is to start. It can symbolize some dragon but what are those bowls there on top?? What’s this device for? It also has a personality. This is 100% clear thing. It’s a copy of Moscow city Kremlin. 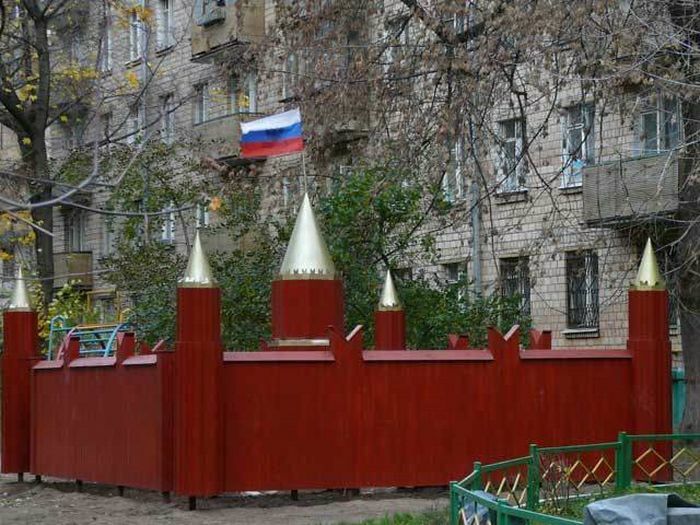 An example of highly fortified children playground. 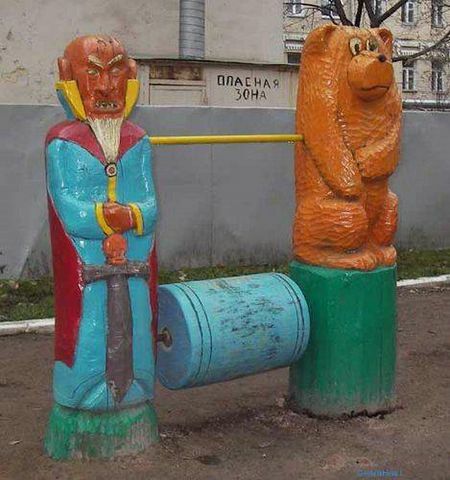 The animal on the left is a bear, it’s traditional, Russian beast. The guy to the left looks like some Chineese or Japaneese samurai? There is also a sign on the background “Dangerous Zone”. Is it because of this playground? These are swings with a mermaid. The author thinks that kids should go natural and understand that mermaids don’t wear swimsuits. 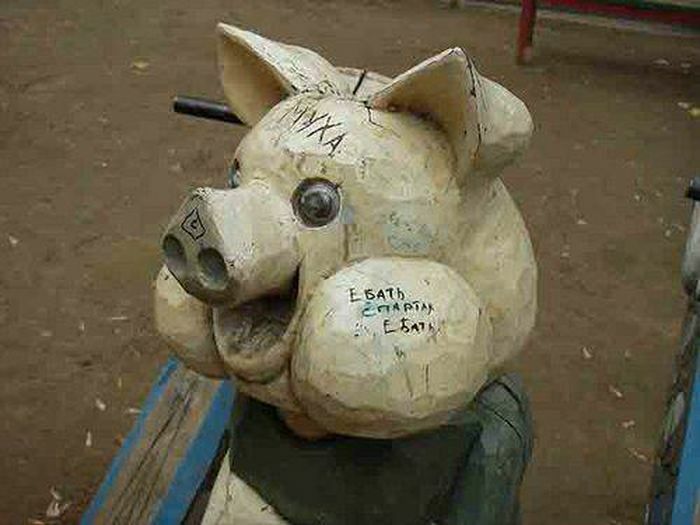 A lot of rude words inscripted on this pig. Who might it be? There are a few possibilities – the wolf with a ball and the rabbit with a ball. The third one – it’s a wolf and rabbit in one. This one is really scary. But you can step inside. Also the snow on this photo lays strangely. There is an illusion that snow spreads from this monster. That’s one is a shy little thingie. 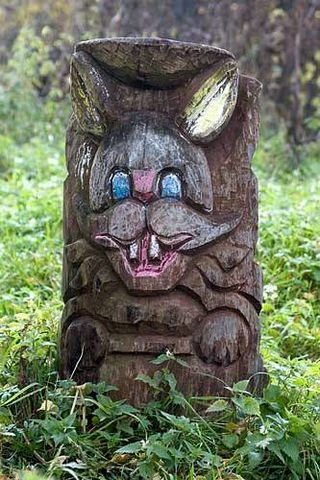 People say that this one was built to commemorate the rabbit who turned into wolf at midnights. It can probably be related with the upper rabbit-wolf structure. This white-blue thingie collects mushrooms and eats them probably, else how would you explain its unidentified specie and very pleased look. 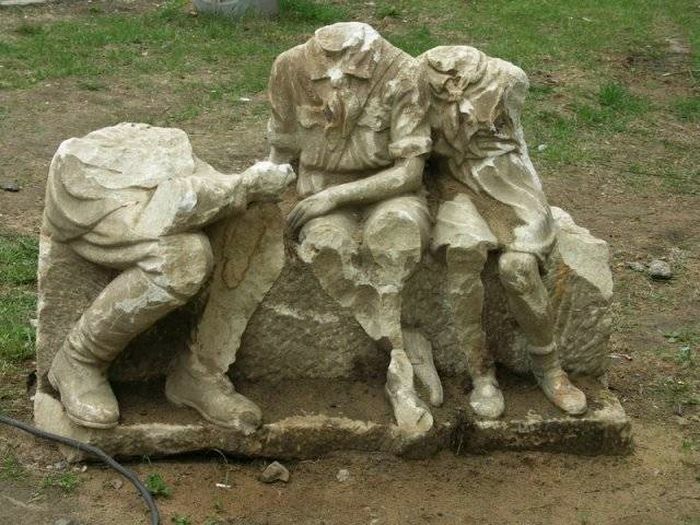 Headless sculptures can teach kids that they should value their heads? The grown up from the left side is more than headless – it may show the trend that more you grow up the less body remains structured. 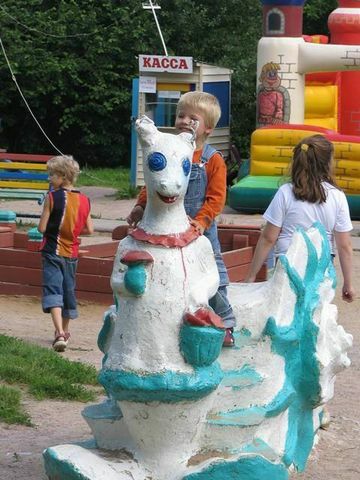 Woah, that dragon one is scary… So now we know why Russian kids are tougher than the rest. Looks like some fine chain saw art scupting in and among other wonderful objects! You might like my USA Southwestern chain saw art! I myself come from an age when playground equipment was made out of plain, honest iron-colored iron! None of this cheap colorful plastics junk! Nor were we protected within an inch of our lives — when we take my granddaughter to the playground these days, swings are protected by what look like cages… seesaws? long gone. No way to raise kids able to look out for themselves! I am not talking about the monsters on the playground. I am talking about the playground itself. Plus you are a girl, so you never got involved into boys stuff, and your parents only allowed you to play Rubber Bands and Jump Rope next to the building. Oh come on, Russ. Not all neighborhoods are that bad. At least in Moscow and major cities. And I would`nt say that American kids grow up in a nice environoment. Just like here, US is different in different parts – it`s not Beverly Hills all over. There are districts where poor people live. There are trailer parks. I believe their ghettos are much worse than our average “unsafe” residental suburb. After all, this whole “youth gang” thing originates not from USSR, but from US. Some of them seem to be the figures from old Russian TV cartoons. For example, on the last photo, the guy with the accordion seems to be the Crocodile Gienia – a wise crocodile that smoked a pipe, lived in a flat and had as a friend that little guy on the right. Here they are in the white color version only but in the cartoon they had been colored. Somebody clearly put a lot of work into building some very cool and unique things for kids to play on. The picture with the bear and the “samurai”. Are you kidding me? Samurai look nothing like that. It’s just a wizard with a sword. Is that so wrong? The mermaid with breasts comment only means that you’re from a country where such things are looked down upon. In europe however, breasts are not as taboo as they are in the US. The pig with obsenities… Well, you should read some of the stuff written on my middle school desk, it’s not any better. The shy little thingy, also seen on the right in the last picture is a popular children’s cartoon character. 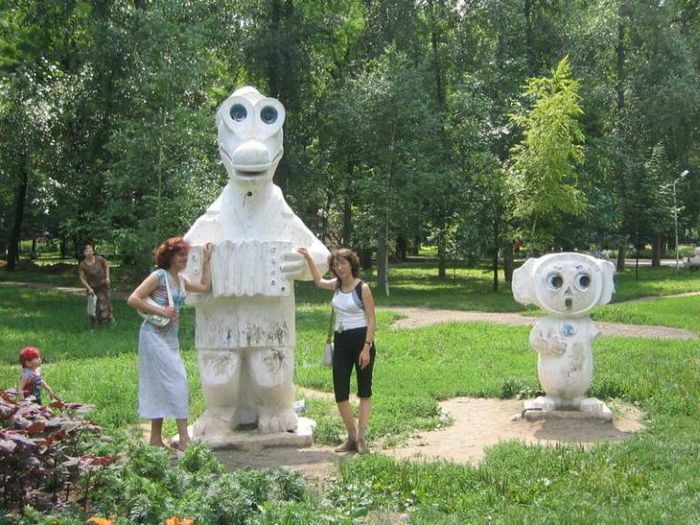 To the left of him (in the last picture) is a crocodile named Gyena (hard g) who is playing the accordion. The scary wooden rabbit and people without heads have no evidence of being anywhere near a playground, more like a random field. I definitely wouldn’t say American kids grow up without conflict. I lived in a motel and kids from the trailer park used to come over and try to invade the family trash pile. My cousins and I would try fighting them off with machetes and rusty saw blades, but the little hellions had sling shots. We were outgunned. It’s more like a playground/artistic exhibition. I live in France and in my city there’s a kid playground made with bigs colorful cows built by a well known artist. Hmmm.. Such bright colors… covered lead paint, I bet. Probably ruined many a Russian child’s cognitive abilities. I grew up in a former socialist country and was very familiar with Russian fairy tales and TV cartoons. 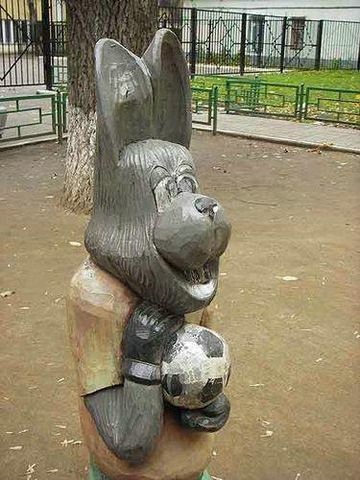 The rabbit holding a football is not a wolf-rabbit, looks like a Zayats (rabbit) from Ny Pogodi. 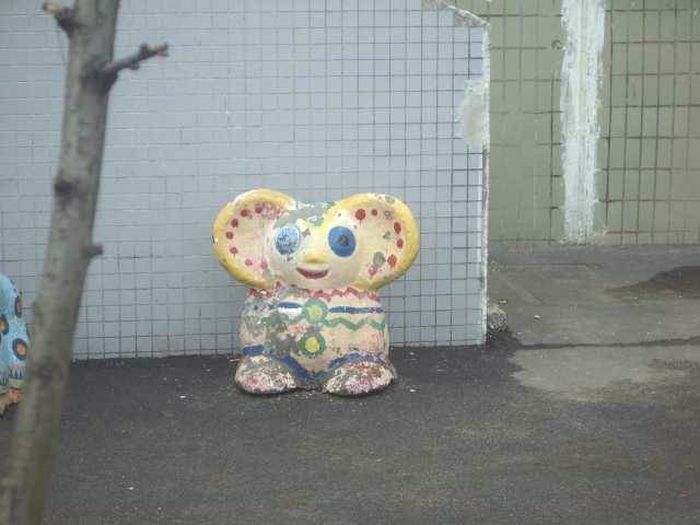 Dragon, bear, mermaid, Kashei, Crocodile Gena and Cheburashka – some are villains and some are not, but definitely not freaky at all. I don’t think kids will find these figures scary – because they all know what they represent. Of course I can see wear and tear and decay on these things, but I find it amuzing how Americans would look down on them just because they’re different from what they’re accustomed to. Thank you for the pictures of the playgrounds! It’s become out of style to have characters as part of the playgrounds (I only see it here in an old park that was built in the 1960s). 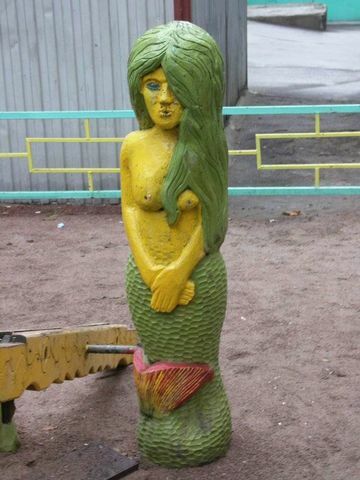 Just a few questions: it looks like the mermaid isn’t by swings but rather by a see-saw (the Russian word for see-saw, doska-kacheli, is similar to swings). And wouldn’t a rabbit that turns into a wolf at midnight be a were-rabbit, or would that have to be a rabbit that turns into a wolf at the full moon? Interesting blend of artistic figures and play equipment. “Figure” structures on North American playgrounds tend to be cars or sea serpents, etc., not this broader range of totems. Pictures of a lot of playgrounds in the U.S. are located in a Playspace Directory tool on the kaboom.org Web site, but few pictures like this, because there aren’t many things like this on American playgrounds! I think those look awesome, and for the record, I’m from the USA. I wish we had more neat stuff like that! There is a really cool mockup of a fighter jet in a park near my place. My kids love it! What I find now is scary ti child’s mind is the ugly staffed animals sold everywhere in US and Canada… What an ugly bunch!.. Scary? That’s what we grew up with. As someone said, we knew these characters and it was not scary. Why would someone say Russian kids have cognitive abilities? This is an insult. What about graffiti in the States? Is it attractive? Is it a behavior of humans to write graffiti on the cars? And just to add… Russian kids had a great childhood and still do. We did not need a parent accompanying us every step of the way. And we grew up good people. Just wanted to add… The comments under each picture are rude. If you do not accept a different culture, do not travel there. I live in the States, and I love it here. 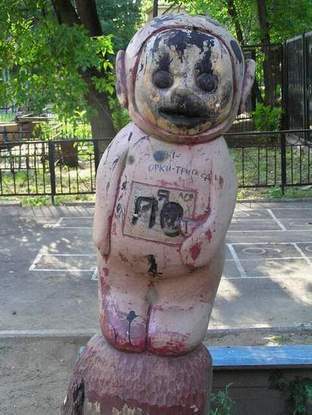 However, understand me right, a year ago, a playground that I used to take my child to was burned by someone. Someone actually started a fire on the playground. So, don’t make fun of the playgrounds from different countries, look at not as great yourselves. Russia is a beautiful country with great and not so great people just like everywhere else. There was built the village on the playground where I played as a kid (5 or 6 small wooden houses). We liked to play there. 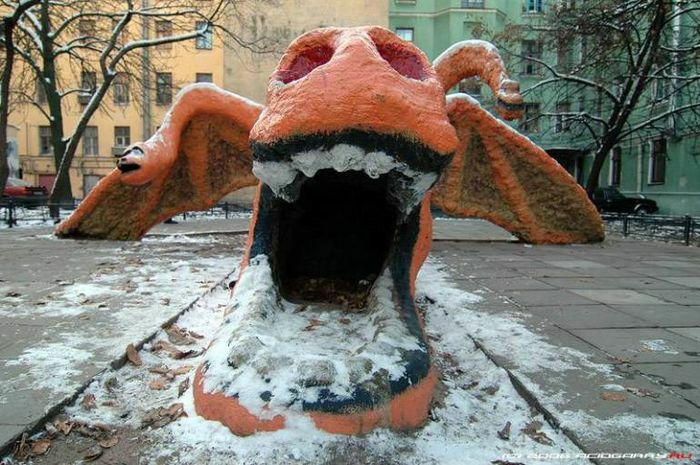 But my fav was a huge wooden Zmey Gorynych (Russian fairy tale dragon with three heads), about twice as big as a grown-up man, and really tricky to climb on. This is nothing, I’m an American and there’s a park where I grew up in Florida called War Veterans Memorial Park and in it they have an actual tank from one of the world wars that kids are allowed to play on and it’s still there today. Top that! Barney and the Teletubbies are a lot more disturbing than these. LOL! We didn’t have any sculptured figures in the Alaskan playgrounds when I was a kid, but we made snowmen, snow forts and snow caves and had terrific snowball wars! There is nothing scary about these playgrounds. Everyone knows who the figures are, and the cartoons and movies they are from. It’s sad to see so many Americans be so rude. Americans never understand different culctures. The reason for this is that the USA payed Gorbachev millions, making him rich and everyone else poor. 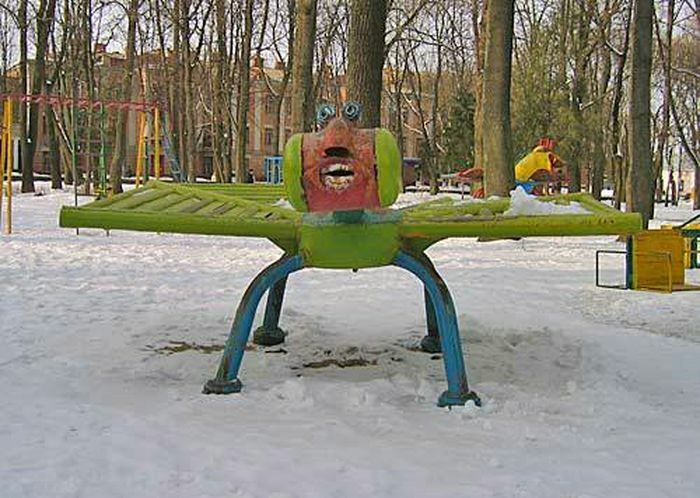 An interesting collection of playgrounds. Most of them are not that innovative in Russia. Kids play in typical plastic “Fisher-Price” like structures. Thank you for the opportunity to view and comment on your blog. Your site is full of good information I can use to make my online business a success. Thanks again and keep up the good work! These sculptures look like they are made with love an I find them very sweet.